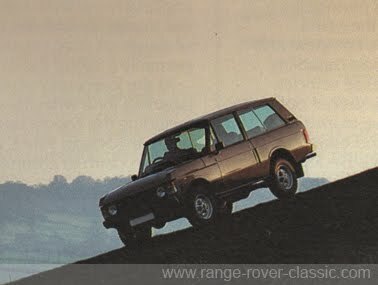 The Range Rover was launched in 1970 and immediately took the market by storm. Indeed, it created its own market throughout the world by setting new and higher standards for four-wheel drive vehicles. During the years since the launch, it has been used in a wide variety of applications ranging from prestigious official duties to expedition transport across desert and outback and through jungle. As a result, it has become one of the most desirable vehicles on the road and has been admired and acclaimed both by customers and by the motoring press. It is often said that imitation is the sincerest form of flattery. If this is true, then the Range Rover has been extremely well flattered. Many of our competitors have tried in vain to match the versatility and quality of the Range Rover. None have succeeded. The introduction of the Phase II Range Rover further extends our dominance of the luxury four-wheel drive market. The extra refinements and additional equipment built into it will allow you to take full advantage of every selling opportunity. It has always been our aim to make sure that our salesmen are fully trained professionals capable of approaching customers with confidence in the product and the company. The only way you, the salesman, can gain that confidence is through a thorough knowledge of the vehicle and its applications. Only then will you be able to answer fully the questions put to you by prospective customers. Together with its features and how they benefit the customer. Each aspect of the vehicle is given a technical description and the main selling points are listed at the beginning of each section. The manual contains a self training element as well as being a valuable selling aid and reference. It is in your own interest to study it thoroughly. You have an important part to play in promoting and selling the new Range Rover, and I am confident that you will take full advantage of the added sales opportunities offered by the introduction of this updated model. The story of the Range Rover goes back to the early 1950s when the idea of a 'Road Rover' was put forward. The original concept was a bigger and better Land Rover, but although test models were built the project was frozen. However, the idea of a luxury Land Rover surfaced again in the mid 1960s, to combine the practicality and crosscountry ability of the Land Rover with the performance and comfort of saloon cars. An engine for the new project was found in America. It was a 3.5 litre aluminium alloy engine which was potentially very powerful yet light in weight. Land Rover took the engine and developed it extensively to suit the needs of the Range Rover. Permanent four-wheel drive and long travel coil suspension were features of the Range Rover from the very start to give exceptional traction both on and off the road, together with a high degree of ride comfort. These two features have remained unchanged and, together with strength and durability, form the basis of the Range Rover concept. 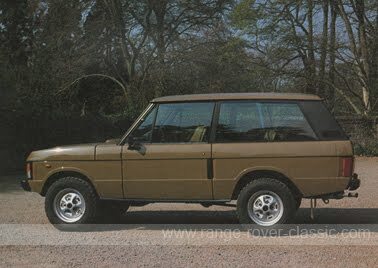 The Range Rover was successfully launched in June 1970, described as 'four cars in one - a luxury car, a performance car, an estate car, and cross-country car. It was received with tremendous enthusiasm and has since proved highly successful in all kinds of applications. For example, after extremely tough tests under all conditions, the Range Rover is now used by many European police forces as a fully equipped motorway emergency vehicle. At the other end of the spectrum it is used worldwide as a luxury car for all occasions. Many of the exploits of the Range Rover throughout the world are well known. One of the most impressive was a drive by two Range Rovers right through the Americas, from Alaska to Ushuaia in the very south of Argentina. At one point the infamous Darien Gap - there are no roads of any kind for 250 miles. Just jungle, swamps, rivers and rough terrain. No other vehicle has yet successfully attempted this journey. 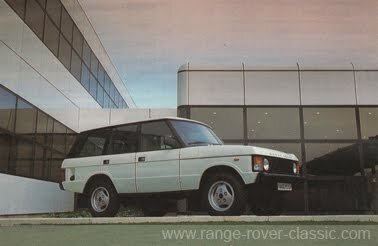 So good was the original concept and design of the Range Rover that little had changed visually since it was launched. A great many refinements, though, have been added to it to keep abreast of modern automotive technology. A major investment in the Solihull production plant was announced in 1978. The result was a new factory using computerised control to increase production while improving still further reliability and quality. Since the formation of Land Rover Limited as a totally independent manufacturing company, major improvements to the Range Rover have taken place to meet customer demands and to satisfy an ever-widening market sector. In 1981, the four door model was announced together with a high compression engine and new gear ratios. A year later automatic transmission became available as an option, as well as refinements to the seats. Then in 1983 a new 5-speed gearbox and transfer gearbox was introduced, together with a central door locking system. The current Phase II Range Rover now has electrically operated side door windows, electronic ignition, a newly designed dashboard and instrument binnacle, and major improvements in driver and passenger comfort. All these improvements, combined with different levels of trim and specification, will keep the Range Rover at the top of its market sector and maintain its position as the world's leading four-wheel drive vehicle. The Range Rover has a unique position in the market because it has, in effect, created its own market sector in which there are no real competitors. Recently, several compact and economical vehicles similar in concept to the Range Rover have appeared on the market, such as the Mercedes 'G' Wagon and restyled Toyota and Datsun/Nissan models. Even though none of these vehicles offer the same degree of refinement, specification and performance as the Range Rover, we have to recognise there are pretenders aiming to copy Range Rover. Over the last two years, the Range Rover has widened its appeal to compete very favourably in the large executive luxury estate car market and has taken an increased share of that market with the improved models and specification. You will see as you read through this manual, the Range Rover is a unique vehicle with an outstanding, world-wide reputation. Since it was introduced, other manufacturers have tried to copy it from both the engineering and styling points of view. Some attempt to challenge the Range Rover directly, offering four-wheel drive, reasonable on-road performance and comfort. Others, like the Matra Rancho and Citroen Safari, compete only in style, but they have far less capability and are only two-wheel drive vehicles. The Range Rover competes not only in the luxury four-wheel drive market, but also with luxury saloons and estate cars in the same price range. This is because many Range Rover owners use their vehicles mainly on the road. But it is also because the style, image and appeal of the Range Rover puts it into competition with all up-market vehicles. Because competition varies considerably from market to market, it is essential that you gather your own material on local competitors and study it in relation to the advantages of the Range Rover. However, it is possible to give a general picture of the Range Rover's position in the luxury off-road and conventional luxury markets and to show which groups of people buy Range Rovers and why. The following information is based largely on European surveys, but many of the points apply world-wide. Competition in this market traditionally comes from top of the range American vehicles such as the Jeep Cherokee and Wagoneer, the Chevrolet Blazer, Dodge Ramcharger, and GMC Jimmy. More recently, though, Mercedes have introduced their'G' Wagon. Although the Audi Quattro shows the importance of style, comfort and safety in this market, it does not compete in terms of rough off-road capability, being primarily a car for use on the road. At the lower end of the market, new Japanese long wheelbase station wagons, including the Toyota Landcruiser '60' series, the Nissan Patrol, and the Colt Shogun claim to compete with the Range Rover. The Range Rover has an enormous potential in the luxury saloon and estate car market, especially in its Phase II specification. Indeed, recent market surveys in the UK have shown that some 25% of customers are replacing a saloon or estate car with a Range Rover. However, since prices and individual reputations vary from country to country, it is impossible to specify the exact competition. Your own knowledge of local vehicles will tell you the most likely competition. As you know, potential customers are usually well aware of competitive vehicles, but this is often based on general ideas than on actual driving experience. So it is vitally important to have a thorough product knowledge of the Range Rover and its competitors so that you can confidently explain the benefits of the Range Rover to your customers. It also emphasises the value of demonstra-tion the vehicle; most prospective customers who have driven a Range Rover show an increased interest in purchasing. Customers who buy a Range Rover primarily for its four-wheel drive performance often live outside towns and may need it for business and leisure. The business users may be farmers and landowners, surveyors, antique dealers or enthusiasts. The choice of a four-wheel drive vehicle depends mainly on its ability to do the job, whether carrying goods or people. But potential Range Rover customers demand far more style and comfort than a utility four-wheel drive vehicle can provide. The Range Rover's towing capability may also influence the purchase decision. 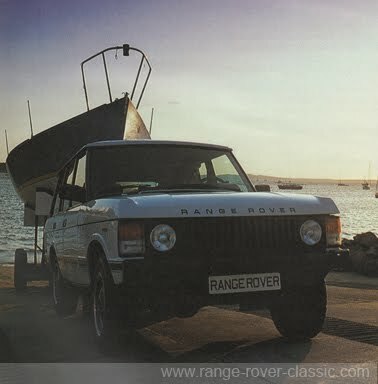 Many other potential Range Rover customers are followers of outdoor sports such as skiing, riding, sailing and shooting. A luxury four-wheel drive vehicle is the ideal choice for these people. Range Rovers are also often used as rally vehicles and have become associated with many prestigious sports such as horse trials, ballooning, bob sleigh racing, hunting and wildlife safaris. Customers replacing a luxury saloon or estate car with a Range Rover may also be living in rural areas and may well be involved in outdoor pursuits. The towing ability of the Range Rover will be an important consideration for many. Not only does the Range Rover meet the customer's needs for a luxury vehicle in comfort, performance and safety, it also has two big advantages over conventional saloon cars. It has a style and image all of its own, and it has the four-wheel drive capability and all that comes with it. Both of these features are most important to the customer looking for a luxury car with a difference. Because the Range Rover satisfies most customers' requirements, the art of selling it consists mainly of making the customer aware of the features which no other four-wheel drive vehicle offers. The main objections which customers may raise are the higher fuel costs associated with four-wheel drive vehicles, and the lower level of luxury compared with cars in the same price range. However, a detailed knowledge of the Range Rover's unique specification combined with a carefully planned demonstration will help you to overcome these objections. The information contained in this manual will be of most value when you relate it to local conditions. If you draw up detailed customer profiles appropriate to your sales area, you will be able to decide which of the Range Rover's many benefits are particularly important to each customer. You can then devise a sales presentation and demonstration to make the most of those benefits.